Building that forever bond between you and your pet can take a lot of work! And whether you start with a puppy or full-grown rescue, the last thing you want is your furbaby to cower at the sound of your voice. Crates take the brunt of training off your shoulders so the relationship you share with your four-legged friend doesn’t have to take a hit. The selection in our Online Store has been expanded to include a variety of “Dens” suited to accommodate dogs of any breed. 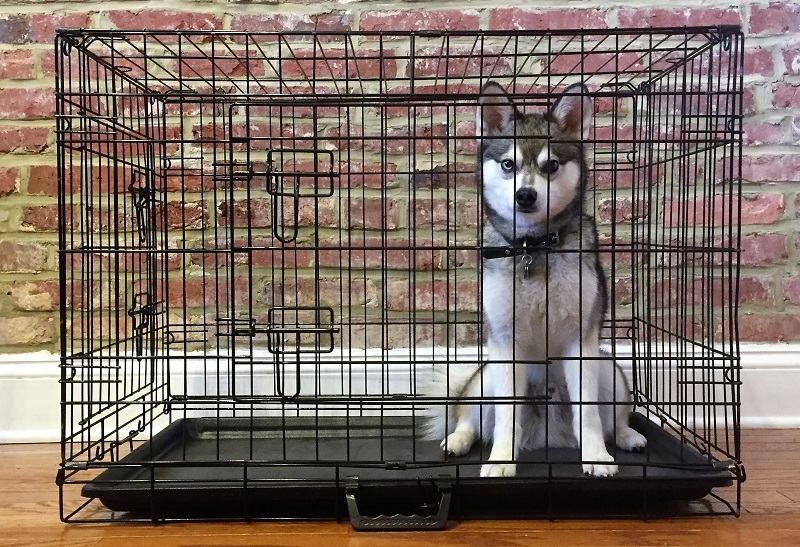 All crates are equipped with a center divider (for those with pups still growing), heavy-duty removable rubber tray for easy cleaning, and front/side gated entries for optimal placement within your home. Each size folds flat (accordion-style) for convenient storage, and comes with attached carry handle for smooth transport. So stop calling it a cage. Just as a prison cell wouldn’t be referred to as a bedroom, so is the difference between a cage and a den. Crate-training is an extension of our love for our faithful companion, not a method of punishment. And by far the most humane way to raise your pooch right, keeping them feeling secure until you arrive home. Thank you for being wonderful with Harper! It has made the transition of having a puppy so much easier knowing she is taken care of during the day! Nice lady, trustworthy, and of course wonderful with the puppies! Thank you so much for watching Millie this weekend. It is wonderful to have someone that we trust to watch Mills! I highly recommend Prancing Pooches! Jessica is great with our dog, Leuven. She's friendly, professional, and extremely dependable. I've recommended her to my friends and family around the area. We're so thankful to know you! You've taken such good care of our Chewie! Thank you so much for taking such great care of Moe! He was so calm and tired and happy for the rest of the day. My dogs do not like everyone but they LOVE Jessica! After the first walk, my roommate complained that doggie Casey liked Jessica better than her! We are very satisfied and the dogs can't wait for her to come back. Thank you for taking care of our babies! Bella and Odin seemed very happy when we got home yesterday. They must love you! Just want to tell you how thankful we are to have you as our dog walker! We really appreciate you taking Molly into your place. Ruffs and kisses! Thanks so much for all of your help with Greivis. He loves you!